The Permissions area allows an association to set restrictions on the database options available to clubs, teams and members when they sign into Membership. It also allows associations to restrict the level of access available to their parent body (eg. regions, zones, states). Please note that these options may vary from one sport to another. 3. The first option on the Permissions screen is to set the level of access you want to provide to your Parent Body/ Bodies. 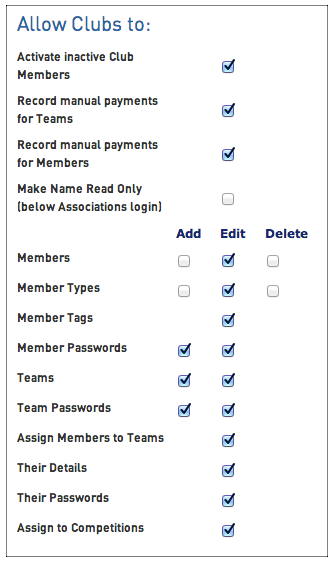 The permissions selected here will apply to all levels above the Association in the database (eg. National, State and Region). Read-Only Access - parent bodies can only view Association, Club, Team and Member data. They cannot edit, add or delete data. Statistical Access - parent bodies can only view statistical data (ie. the number of members, clubs and teams) on the Association and its Clubs, Teams and Members. They cannot view member names or contact details, nor can they edit, add or delete data. No Access - parent bodies cannot view or edit any Association, Club, Team or Member data. 6. 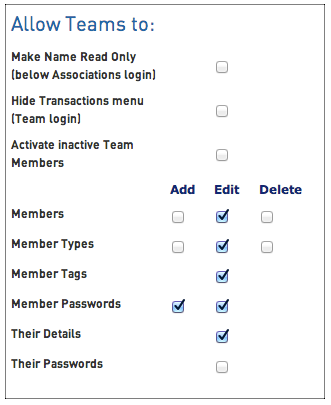 The next section allows you to select permissions for members within your association. This is now redundant, as members are not able to access their record in Membership. 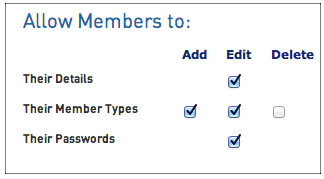 Instead, they update their details through the Registration Form module, not through the member record in Membership. When you have selected all the permissions, click on Update Permissions. These will now be in effect. You can change the permissions at any time.